Did you receive a archive file with file extersions like zip, rar.Compressing files saves space but the problem is that most recipients don’t have a tool required to extract the archive.There are also online tool for extracting from compressed archives like zip using online tools, but the problems is that you could end up exposing the files of the archive to a 3rd party service provider.Current day archiving tools support most common formats, but most commonly, users only need to extract files and not compress them. 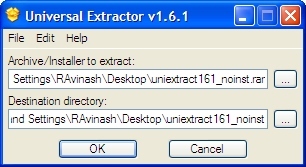 If you mostly extract files from archives then your can try Universal Extractor which is a free tool that can decompress and extract files from any type of archive or installer, such as ZIP or RAR files, self-extracting EXE files, application installers, etc., but the point to remember is that this tool does not support “COMPRESSING”, so it does not fully replace your default archiving tool, but a very good alternative to have incase your default application does not support the archive format that need to extract files from.It supports 59 archive file formats. There’s also a portable version of Universal Extractor, which you can have with you so don’t have any problem of extracting files from compressed files. The installer has the option of integrating the application with the context menu during the installation and association with with all supported archive format of the app, whereas while using the portable version to extract an archive, one needs to do it from the interface of the Universal Extractor. The temporary and duplicate files can be removed during and after the extractions and the debug directory( by default the OS temp folder, which can also be changed ) can also be set from the “Preferences”. Universal Extractor using many open source command line tools to extract files from multiple archiving file formats and also checkout How To Extract Multiple Archives at Once.